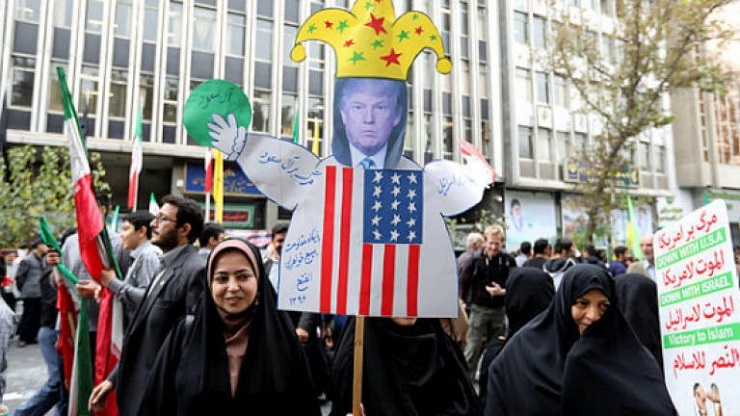 Like a tsunami, wave after wave of Iranian protestors demonstrated outside the former US embassy in Teheran, carrying placards openly criticizing the US President Donald Trump and the Saudi King Salman Al Saud and Crown Prince Mohammad bin Salman. Photographs and footage of this unanimous show of determination – and rejection of the aggressive policies of Iran’s enemies- have been broadcast by media around the world. This demonstration was just one of many such events, which clearly show the Iranian people’s wish to follow the path they have chosen and resist the US’s attempts to stifle their nation. For Donald Trump, in a clear breach of international law, has withdrawn the US from the so-called nuclear deal with Iran, which was signed by many of the world’s leading nations, and in November he imposed new, very harsh, and illegal sanctions on Teheran. The new version of the embargo against Iran’s oil and shipping sectors includes restrictions on the financial operations which are central to Iran’s export of its oil and gas. Washington – as represented by the US leader Donald Trump – has sworn that it will be “implacable” in its actions against Iran, and Secretary of State Mike Pompeo has firmly stated that the US wants Iran to “do a 180-degree turn” and abandon its “current revolutionary course”. However many politicians, including at the very highest level, immediately expressed doubts that the embargo would have much effect. Firstly, as soon as Donald Trump’s administration announced the new sanctions, it issued a list of 8 ‘exempt’ countries, including China, India, South Korea, Japan and Turkey, which are among the biggest importers of Iranian oil. In 2017 these five nations together accounted for 70% of Iran’s exports of crude oil and condensates. China, one of the parties to the nuclear deal, accounts for almost 25% of Iran’s oil export market. Secondly, the European Union, along with other countries which are parties to the nuclear deal and are not on the ‘exempt’ list, has announced that it will continue to honor the terms of the deal as long as Teheran does the same. The EU has also promised to pay compensation to European companies who suffer loss as a result of the US sanctions, and it is trying to set up a “special mechanism” for making payments to Iran. This mechanism will operate outside the international SWIFT payment system and may make it possible for the EU and Iran to make and receive payments under contracts, without any US involvement. Despite these efforts, it is unclear how much trade will still be going on between the EU and Iran. Under pressure from the US, a number of major European companies in the energy, shipping and insurance sectors have already announced that they were discontinuing their joint projects with Iran. For example, the Danish company A.P. Møller-Mærsk, one of the world’s largest operators of container ships, which also has a large division providing oil and gas exploration, drilling and other related services, has announced that it is terminating all its activities in Iran. As Soren Skou, the company’s Managing Director has said: “You can’t do business in Iran if you also have business in the US, and we have that on a large scale.” And, the day before the issue of that statement, the French energy giant Total announced that it would withdraw from a multi-billion-dollar project at Iran’s South Pars gas field unless the US exempted the project from the sanctions. Thirdly, the market itself is working against the US sanctions. The fall in the volume of oil that Iran won’t be able to sell will be offset by higher oil prices, and Iran is unlikely to see a major fall in its revenue from oil exports. In February the spot price for Brent oil remained in the region of $60 per barrel. It rose to $80 per barrel after the US withdrew from the nuclear deal and then in October it went up to $86 per barrel in response to the fall in oil output from Venezuela. Donald Trump has put a lot of effort into persuading his allies in the Middle East to increase their output, but even then, as of November, prices had only decreased to the level of $70 a barrel. Since the Iranian government budget is based on a price of $55 a barrel, Teheran may still be able to receive more income than expected. It became clear that Donald Trump’s policy was doomed to fail after the recent OPEC+ meeting. The day before the meeting Donald Trump tweeted: “Hopefully OPEC will be keeping oil flows as is, not restricted. The World does not want to see, or need, higher oil prices!” But, in spite of the pressure from Donald Trump, who demanded that prices be kept low, the main oil exporting countries, including Russia, agreed to cut oil production in the first half of 2019 by 1.2 million barrels a day. “We’ll cut 1.2 million bpd total,” announced Thamer Abbas al-Ghadhban, the Iraqi Oil Minister. He added that that represents slightly more than 1% of global oil production, according to the France Press news agency. The members of OPEC+ hope that this measure will keep oil prices at a high level. The OPEC countries will decrease their combined production by 800 000 barrels a day, while the non-OPEC countries will cut their production by 400 000 barrels a day. Suhail Mohamed Faraj Al Mazrouei, the UAE’s Minister of Energy and Industry, and current President of OPEC said in a press conference that the OPEC+ group had agreed to exempt Iran from any production cuts. The response of Hassan Rouhani, President of Iran, to Donald Trump’s policies and the new sanctions has been fairly restrained: he has said that these aggressive measures targeted at Iran and the Iranian people have had no effect on Iran’s economy, because they were nothing new -Washington had already, in effect, reimposed them earlier. If we look at the US’s most recent actions, and Donald Trump’s conduct in relation to Iran and the whole Middle East region, then one thing becomes clear. For almost 30 years, since Operation Desert Storm, the US has been engaged in an ongoing- and unsuccessful- social experiment: an attempt to bring democracy to the Middle East in order to create long-term “stability”. But America’s clumsy military interventions, while growing in scale, have failed to change anything. In reality, the US interventions have destabilized the region. Nevertheless, Washington continues to cling on to its status as global hegemon, and to exert pressure, impose limits and keep in check any country that tries to resist it. Even if that means provoking a conflict. Moreover, the US refuses to respect any international rules, has declared that it will withdraw from the INF treaty and is ready to withdraw from the new START and the NAFTA, and in general, is trying to rewrite all international rules to suit itself. The world has seen all this in the past and has survived it all. And the US’s role as global policeman will also come to an end. Pakistan: the First Foreign Visit of the Prime Minister Imran Khan or Who Is the Boss Here?